Please join us for a festive evening of fellowship and fundraising! 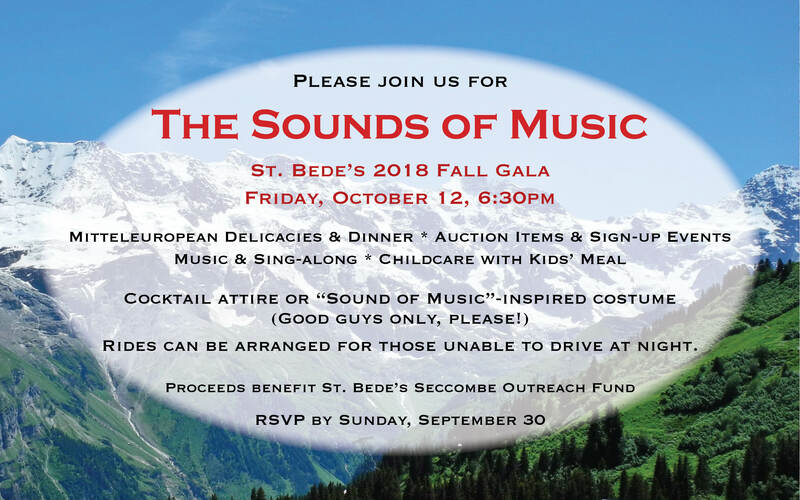 All proceeds go to St. Bede’s Seccombe Outreach Fund, which makes annual grants to our nonprofit community partners and buys food for needy children and homeless families served by two of them, Ecumenical Hunger Program and Home & Hope. Bid on a week in a home on Hawaii’s Big Island! Details and photos here. Save the dates for exciting events on auction: See them here. Save the dates for fun sign-up events: See them here. Note: The drop-down menu will allow you to choose from a variety of tickets. Adults (21+) have the option of choosing tickets for $60 or $75, in which case $10 or $25, respectively, will be considered a donation to the Seccombe Outreach Fund, above the cost of the event. Tickets are $30 for ages 13 to 20 and $15 for ages 2 to 12. There is no fee for children under 2, but please mention in special instructions to seller at checkout if you are bringing an infant or toddler who will need nursery care. Shared rides are also available for those unable to drive at night; please state “ride needed” in special instructions to seller. We greatly appreciate your support through underwriting or ticket donations of any amount. Both help us to be as inclusive as possible while raising the final tally for a worthy cause. All amounts donated through this button are tax-deductible as permitted; please note in special instructions to seller at checkout if you’d like to specify that your donation be applied to underwriting or tickets.